Ventnor joins a growing number of Atlantic County communities investing in durable waste carts. The wheeled, 96-gallon carts are easy to maneuver and come with an attached lid that keep materials contained and dry. As gatekeepers to the Atlantic Ocean, Ventnor has a particular responsibility to prevent litter from reaching the shore. Carts are an effective litter prevention tool that keep items from escaping on windy days. The carts will also provide a more unified look at the curb and increase the amount of recycling residents can put out for collection. According to stats provided by the Atlantic County Utilities Authority (ACUA), towns that have purchased carts for their community have seen a 5 to 10 percent increase in recycling. An increase in recycling would reduce the City’s trash disposal costs and increase the recycling tonnage grant Ventnor receives from the state – not to mention the environmental benefits! The City will pay for the carts over its seven-year shared services contract with the ACUA. A grant from the Recycling Partnership will reduce the cost of recycling carts and provide funding for education and outreach efforts. Carts are expected to be delivered to residents in May 2019. In addition to the cart purchase during its contract renewal with ACUA, the City also ended trash collection services for commercial businesses. Typically, towns do not provide or pay for a commercial business’s trash collection, and not every business in Ventnor was receiving service. Businesses will be required to purchase their own trash services beginning April 1, 2019. Recycling will continue to be collected at no cost to commercial businesses. The change will provide a large savings for taxpayers. Plans to demolish and rebuild the City’s second firehouse continue to progress. The existing facility has deteriorated and would need to undergo costly immediate repairs to make it livable and structurally sound. Furthermore, the structure would not meet FEMA requirements for critical infrastructure. The City is required to have two firehouses to comply with National Fire Protection Association (NFPA) standards that dictate response time requirements. Having a second location also reduces fire insurance costs for homeowners. Ventnor’s second firehouse is particularly essential to the Ventnor Heights area and enables the department to respond to emergencies if the Dorset Avenue Bridge was impassable. On average, emergency calls from Ventnor Heights make up approximately 30 to 35 percent of the Fire Department’s call volume. In 2018, 994 calls came from the Heights compared to 836 in 2017. The new firehouse will be built to meet critical infrastructure requirements and withstand extreme flooding. It will ensure that residents in low-lying, flood-prone areas can be reached in the event of a storm and serve as an inland location should a severe storm impact the island. The new, fully compliant firehouse can also be used in emergency situations to hold rescued individuals. The City received eight bids on the project and will invest approximately $3.3 million on its construction and furnishing. The cost reflects the requirements set by state and federal guidelines, which includes mandated building materials, the inclusion of ADA components, such as an elevator and chair lift for visitors, and labor costs that must meet prevailing wage standards. The streetscape improvements for the North Beach Business District along Atlantic Avenue between Weymouth and Surrey Avenues are expected to begin this month. Ocean Construction of Marmora will complete the work, which will be funded largely through a grant from the New Jersey Economic Development Authority. The improvements include new sidewalks, strategically planted trees, bike racks, new trash and recycling containers, decorative street lights as well as a boardwalk accents by new seating areas. The improvements will create a safer and more enjoyable experience for pedestrians, business owners, bicyclists and drivers. Ventnor will host an environmental event in honor of Earth Day on Saturday, April 27 from 10 a.m. to 12 p.m. Document shredding and other activities will take place on S. Newport Avenue and an accompanying cleanup hosted by the City in partnership with the Ventnor Green Team, Sustainable Downbeach and Surfriders, South Jersey Chapter, will be held on Wellington Avenue. Residents can bring up to two boxes of material for shredding and local environmental groups will offer fun activities -- including the chance for children (and inquiring adults) to touch one of ACUA’s recycling trucks and meet their mascot Supercan! Cleanup volunteers will meet at Wellington Avenue and be treated to a BBQ following their hard work. Stay tuned for details as the event gets closer! Playgrounds - Commissioners awarded a $15,000 contract for design and construction services for the City’s four playgrounds to DeBlasio and Associates. Pier Bathroom and Offices – The City will go out to bid shortly for construction of a new pier bathroom and offices. Thanks to a proactive meeting early in their administration between the City and Green Acres, Green Acre grant dollars will fund this pier enhancement. Library and Community Building - Commissioners awarded a $26,000 contract to Doran Engineering for window replacement, door replacement where necessary, and repair to exterior finish of the Library and Community Building. Drainage Improvements - The City is in the midst of receiving proposals for engineering consulting services for Wellington and Lafayette Avenue drainage improvements. Bike Racks – Thanks to a grant administered by Atlantic County and pursued by the Green Team, bike racks will be added to various locations. Ventnor was the recipient of a bikeway grant from the New Jersey Department of Transportation (NJDOT) to create a bike lane along Atlantic Avenue connecting Longport to the new Stockton University Campus along Atlantic Avenue. Dedicated bike lanes are proven to create safer conditions for both bikers and drivers and help make biking a more viable mode of transportation. The lane is expected to be complete by the fall. The lanes will be built on the recommendations of the Ventnor-Margate Bicycle and Pedestrian Safety Plan completed by an engineering firm in 2016. The plan, developed to meet our community's specific challenges, such as increased summer population, aims to increase safety for all those utilizing our roadways. View the full study and plan by clicking here. 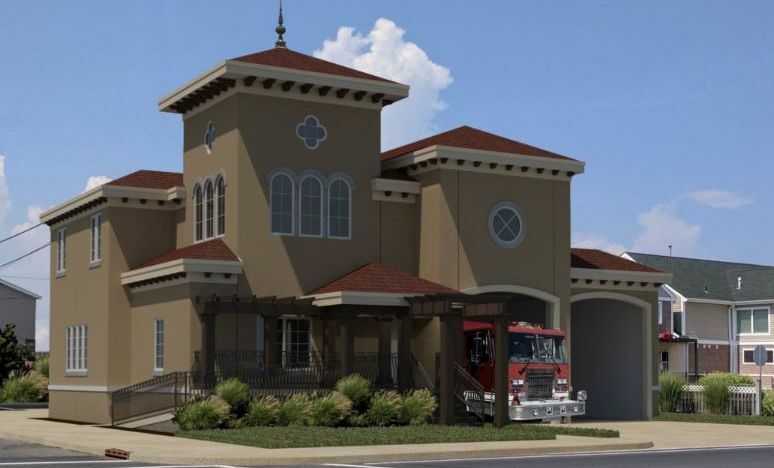 Design and engineering plans are currently being drafted for Ventnor City's second fire station on Wellington Avenue. The current station has served as the City's second firehouse since 1973. Over time, the department and its equipment have outgrown the facility, and the structure no longer meets FEMA's requirements for critical infrastructure. Commissioners voted in January to tear down the building and replace it with a new, fully compliant firehouse. Bids for demolition and construction will commence once design plans are finalized. It is expected that demolition be complete before the end of the year, and construction to begin in early 2019. Did you know? Ventnor City is required to have two firehouses to comply with National Fire Protection Association (NFPA) standards that dictate response time requirements, which keeps fire insurance costs low. The two stations also ensure the department could get to those in need if the Dorset Avenue Bridge was up. Ventnor’s Planning Board and Governing Body recently adopted changes to the R-7 Zone to encourage and entice new development. Currently, two-family dwellings are not permitted in the zone, but have been allowed to be demolished and rebuilt under a process that has not complied with state and local planning regulations. When Commissioner Lance Landgraf became aware of this, suggestions were made to the Planning Board that would encourage the redevelopment of the two-family homes, but in a manner that is both appropriate and in compliance with the state requirements. The result was an ordinance, now adopted, that allows, under a conditional use, that two-family dwellings that have a valid certificate of nonconformity, provided all bulk requirements are being met, to be demolished and reconstructed without the need for a variance. This type of redevelopment was very successful in Margate and encourages new construction that meets both the local construction code and FEMA flood elevation requirements. Planning Board Chairman Jay Cooke, Vice Chair Tom McAdam, Board Member Roman Zabihach, along with Board Planner and Engineer Roger McLarnon and Solicitor Leo Manos, Esq., came together and drafted the amendment that will enable the redevelopment to be conducted with our regulations and at cost that is minimized by eliminating the board application process. City Solicitor Tim Maguire put the final touches on the ordinance and briefed the Mayor and Commissioner Kriebel on the ordinance before the adoption. Numerous other common-sense zoning ordinances are being reviewed as part of Sustainable Ventnor and as a result of the Master Plan Review. Keeping a city up and running as efficiently as possible takes effort and planning. As a way to make this process as effective as possible, Ventnor commissioned James M. Rutala and Associates and Arthur Ponzio to develop a Capital Improvement Plan for Ventnor. While a Capital Improvement Plan may be designed to forecast any period, it generally extends beyond the current operating cycle or administration and usually covers a three-to five-year time frame. Using its capital plan, city commissioners prioritized certain infrastructure projects and recently issued a bond ordinance to pay for the upgrades and improvements. Because Ventnor saved money on collective bargaining agreements last fall, refunded exisiting bonds and will maximize grant funds, only a slight increase in taxes, if any increase, will be incurred. The city is also hoping to borrow money through the New Jersey Environmental Infrastructure Trust (NJEIT) to fund certain repairs. The NJEIT is a state borrowing program that lends money to communities for infrastructure repairs and improvements at very low interest rates. • Bond ordinance 2017-038 amends an ordinance approved in 2007 and increases the previous appropriation by $846,000, bringing the total bond amount to $1,230,324. 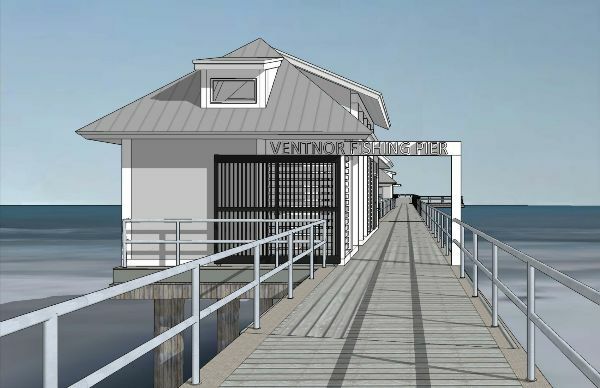 The breakdown on projects includes $450,000 to rehabilitate the Ventnor Fishing Pier; $676,400 for improvements to the library, lifeguard stations and tennis courts; $139,600 for public safety equipment including lifeguard boats, parking meters, recording equipment and turn-out gear; and $30,000 for basketball court improvements. About $800,000 has already been funded through a Green Acres grant. • Bond ordinance 2017-039 appropriates $400,000 for water and sewer utility improvements including replacing sewer mains and lateral improvements on the Wellington and Winchester lines, plus improvements to the gas chlorine system and the Surrey Avenue pump station. • Bond ordinance 2017-040 appropriates $4,576,430 for water and sewer utility improvements including lateral improvements on Baltimore, Derby, Newark avenues from Monmouth Avenue to Winchester Avenue; stormwater evaluations and improvements; water mains at various locations; and the purchase utility trucks, ATVs, a trailer, fire hydrants, meters, meter housing and an emergency generator. • Bond ordinance 2017-041 appropriates $13,209,039 for general capital improvements as follows: $800,000 for bulkhead improvements at Surrey and Calvert avenues; $500,000 for drainage improvements on Kingsley Drive; $3,774,700 for improvements to the public works building, including grading the lawn and installation of a new roof, Fire Station 2, the library, tennis courts and municipal lot. The bond also appropriates $3,799,536 for improvements to various roads; $500,000 for curbs, gutters and ramps; and $1,225,900 for public safety vehicles, security cameras, surf boats, jet skis and SUVs. The bond appropriates $709,000 for a fire engine and ambulance; $480,000 for an SUV with plow, a loader, backhoe and crane; and $1,419,903 for an elevation assistance program that will be reimbursed by a grant. • Bond ordinance 2017-042 appropriates $1,785,000 for park and beach improvements including improvements to Ski Beach, landscaping and installation of a living shoreline at Ventnor West, the city’s share of beach replenishment and ramp walkover improvements. "Much of the city's vital infrastructure, including both the sanitary and storm sewer systems, as well as bulkheads, are in need of repair," said Commissioner Tim Kriebel. "These systems are the backbone of our community and having them in good working condition directly impacts property values. It would be negligent of us as commissioners to let these systems deteriorate any further," Kriebel noted. Click here to view a copy of the city's capital improvement plan. Ventnor property owners who have flood insurance through the National Flood Insurance Program will start to receive a greater flood insurance discount. Mayor Holtzman stated, "The City has been successful in increasing its flood insurance discounts to 25 percent." As of October 2017, there were 4,747 property owners in Ventnor with federal flood insurance. Over $1 billion worth of property is insured with policyholders paying $4.2 million in premiums in 2017 alone. A twenty-five percent discount will save the residents of Ventnor at least $1,056,800 next year. Since flood insurance rates are increasing each year, this savings will grow in the future. With this recertification, Ventnor is now rated Class 5 which is the highest level achieved by any community in the area. The flood insurance discount is based on the total number of points that the City earns. A community accrues points to improve its CRS Class rating and receive increasingly higher discounts. Points are awarded for engaging in any of 19 creditable activities, organized under four categories: public information, mapping and regulations, flood damage reduction, warning and response. The 25-percent premium reductions for property owners will take effect until after May 1, 2018, when they renew their current flood insurance policies or changed flood insurance providers. Rutala Associates, the City's Planning Consultant, led the reclassification effort. "This was a team effort," continued Mayor Holtzman. "Special thanks to several city officials for their assistance in helping the City achieve a Class 5 rating, including City Administrator Maria Mento, Dino Cavalieri, Community Rating System Coordinator; Jimmie Agnesino, Building Official; Donna Peterson, Emergency Management Coordinator; Police Chief Doug Biagi; Dave Smith, Public Works Director and City Engineer Roger McLarnon." Ventnor officials are already working to achieve a Class 4 certification to further increase the insurance discount to thirty percent. A prerequisite to a Class 4 is the completion of a Watershed Management Plan. The City, along with Margate and Longport, have been awarded a grant from Sustainable Jersey to develop this Plan. The Stockton Coastal Research Center has been retained to develop the Watershed Management Plan which should be completed early in 2018. Any Ventnor homeowners that had Sandy damage and are interested in elevating their home are encouraged to apply for FEMA Flood Elevation Assistance. Grants from the Federal Emergency Management Agency's Flood Mitigation Assistance (FEMA-FMA) Program are expected to be available incrementally over the next several years. Through the Flood Mitigation Assistance Program, eight properties were awarded grants in 2016 and five in 2017. Applications are now being accepted for 2018. The FEMA program provides resources to assist communities in their efforts to reduce or eliminate the risk of repetitive flood damage to buildings that are insured under the National Flood Insurance Program. To apply, please contact Jim Rutala at jmrutala@comcast.net. Mr. Rutala will assist each applicant and work through the requirements with them. Pictured above is one of several Ventnor City Streetscape Concept Designs prepared by Marathon Engineering for the North Beach Business District. Improvements to the area are set to begin after the 2018 season to minimize disruption in the area. As a result of damage and lost ratables incurred from Superstorm Sandy, the city secured an $800,000 streetscape grant from the New Jersey Economic Development Authority for the North Beach Business District. The improvements will contribute to the revitalization of an area financially impacted by the storm. The streetscape improvements will include the installation of hanging plants from decorative street lights, trash and recycling containers, pedestrian scale lighting, sidewalk improvements, way finding signage and street trees and decorative tree grates to help create a better walking experience and sense of place, while also improving pedestrian safety by softening the appearance of the roadway, calming traffic and making bicyclists and pedestrians more visible. Street trees in particular have been documented to provide several general benefits (e.g. reduced air and noise pollution, traffic calming and protection from the elements). The improvements are estimated to cost approximately $250,000 per block. To view the complete concept design package, click here. Did you know that the transportation sector in New Jersey is responsible for more than 43 percent of all greenhouse gas emissions? Because of this, the State of New Jersey is offering incentives to communities and businesses to install charging stations. Sales of electric vehicles continue to climb steadily throughout the country and the need for charging infrastructure is growing quickly. In order to be ahead of the curve, Ventnor City Commissioners are considering a recommendation from the green team to update zoning ordinances to include Electric Vehicle Supply Equipment as a permitted accessory use in select or all areas of the city. The city will also consider a plug-in electric vehicle ordinance which includes regulations and design standards for electric vehicle parking spaces and design standards for installation of charging stations. Thanks to a $137,000 grant from the New Jersey Department of Transportation, Ventnor and Margate will soon be receiving new bicycle racks throughout both communities. The bike racks, which are made in the U.S.A. and will sport various designs, depending on their location, will be placed on public property to address the growing popularity of biking throughout Absecon Island. Diane Birkbeck, a member of the city's green team, was instrumental in moving the project forward. And avid biker, Diane was aware of locations throughout the city where bike racks were lacking and helped pick site-specific designs. For example, the bike rack in front of city hall will feature a large "V". Look for construction and installation to begin this spring.